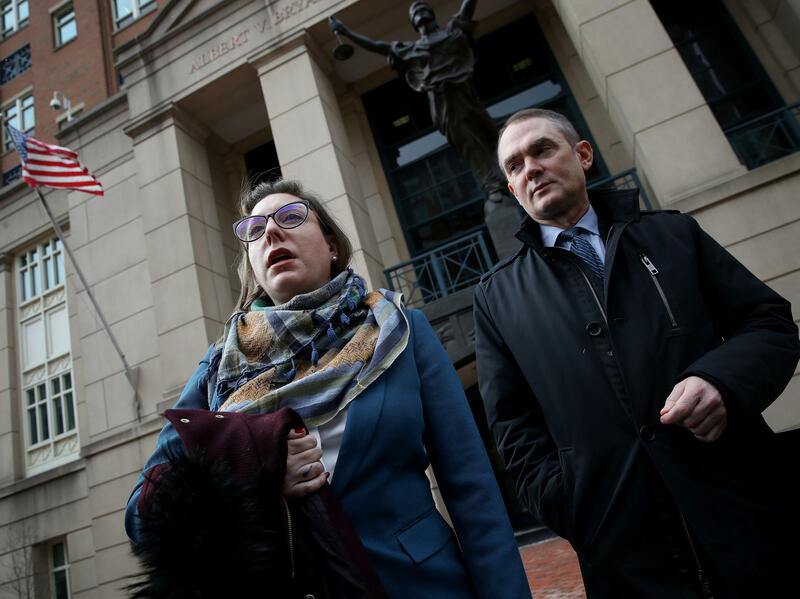 Attorneys for Chelsea Manning — Moira Meltzer-Cohen, left, and Christopher Leibig — speak after she was taken into custody after refusing to answer questions from a federal grand jury investigating the release of documents to WikiLeaks. Chelsea Manning, the former Army private, is back in U.S. federal custody, jailed over her refusal to testify before a grand jury in a case involving WikiLeaks and Julian Assange. Judge Claude Hilton of the U.S. District Court in Eastern Virginia ordered Manning to jail Friday "after a brief hearing in which Manning confirmed she has no intention of testifying," the Associated Press reports. Hilton said Manning must stay in custody until she either changes her mind about testifying or the grand jury finishes its work. The order sending Manning to jail is under seal, but the judge issued the sanction against her in open court, the clerk's office told NPR. After Manning refused to testify, Hilton remanded the former intelligence analyst to the custody of the U.S. Marshals Service. Manning first reported to the Albert V. Bryan U.S. District Courthouse on Tuesday, hoping to cancel a subpoena to testify in what has widely been reported as an investigation into Julian Assange and WikiLeaks. Details of the case remain under seal, the clerk's office said. "Manning has said she objects to the secrecy of the grand jury process," the AP reports, "and that she already revealed everything she knows at her court martial." Manning has previously acknowledged leaking hundreds of thousands of military and State Department documents to WikiLeaks in 2010, from battlefield reports to U.S. embassy cables. The judge's order came at what Manning on Thursday described as a contempt hearing. In a statement, Manning said that on Wednesday she had "appeared before a secret grand jury after being granted immunity for my testimony." 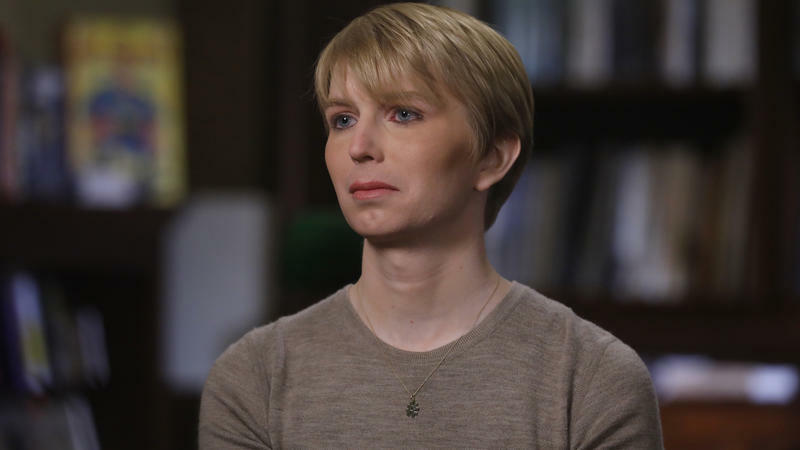 "All of the substantive questions pertained to my disclosures of information to the public in 2010 — answers I provided in extensive testimony, during my court-martial in 2013," Manning said. "I responded to each question with the following statement: 'I object to the question and refuse to answer on the grounds that the question is in violation of my First, Fourth, and Sixth Amendment, and other statutory rights.' "
Manning is now returning to jail nearly two years after being freed from a military prison in Kansas, where she had been serving a 35-year prison term. Former President Barack Obama shortened her sentence to about seven years shortly before he left office. 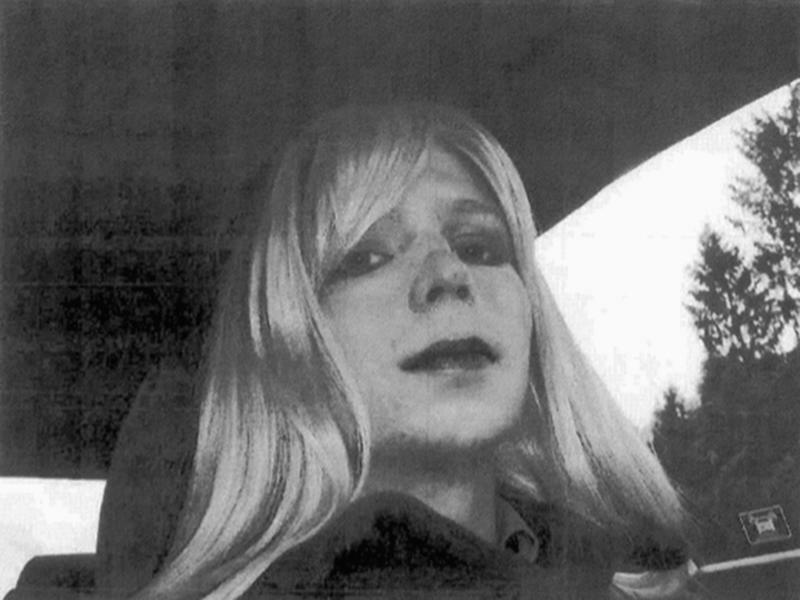 Manning, a transgender woman formerly known as Bradley, had requested clemency from Obama in part because she said her life was at risk in an all-male prison. Her attorneys also said she had suffered in solitary confinement and was denied proper medical and health care. Speaking outside the federal courthouse in Alexandria on Friday, Manning's lawyer, Moira Meltzer-Cohen, told reporters that the Marshals Service has a responsibility to make sure Manning remains healthy. "As everybody knows, Chelsea has tremendous courage," Meltzer-Cohen said. "Our primary concern at this point is her health while she is confined. And we will be paying close attention." Meltzer-Cohen, a New York-based defense attorney, specializes in First Amendment cases. She has also represented other clients in dealings with federal grand juries — including refusals to testify. The Institute of Politics at Harvard Kennedy School announced Wednesday that Chelsea Manning would be one of its visiting fellows, but less than two days later, the school's dean withdrew the invitation. Manning, a 29-year-old transgender woman, formerly known as Bradley Manning, was convicted of leaking classified information. Donald Trump took aim at Chelsea Manning in an early morning tweet on Thursday. The tweet appears to refer to an op-ed published in The Guardian on Thursday morning, in which former Army Pvt. Chelsea Manning criticizes former President Obama as having been too willing to attempt compromise with his political opponents and being insufficiently progressive. She did not, however, call Obama a "weak leader" in so many words, as Trump's tweet might suggest.